You are here: Home › Further Reading › JFK Assassination FAQs › Who Is ‘Prayer Man’? If the figure standing in the shadows of the TSBD entrance is a white man, he must be either Lee Oswald or someone who was not a TSBD employee. Dave Wiegman and Jimmy Darnell, two of the news cameramen travelling in the motorcade, began filming when they heard gunshots. For several decades, the significance of their two films was thought to lie in their portrayal of the spectators along Elm Street and the cars in the motorcade. More recently, attention has been drawn to the films’ depiction of the doorway of the Texas School Book Depository, and in particular to a previously ignored figure who, according to some observers, may have been Lee Harvey Oswald. In several frames of the two black–and–white news films, a figure is visible in the western corner of the TSBD doorway. From the cameras’ point of view, the figure is standing to the left of the man in the Altgens photograph who has been identified as Billy Lovelady. The figure’s right arm appears to be raised across its chest, which has earned it the name ‘Prayer Man’. The figure is unlikely to have been praying, but it may have its arms crossed, or it may be holding an object up to its chest. Although the figure in the currently available versions of the films is insufficiently distinct to permit a definitive identification, it appears to be a white man, dressed in a loose, dark–toned shirt with an open neck and either short or rolled–up sleeves. The figure does not appear to be wearing a white shirt or a tie, as would have been customary for male office workers in the early 1960s. Its short hair and light skin tone strongly suggest that it is neither a woman nor a black man, although the lack of definition in the images does not completely rule out either possibility. The figure’s head and hairline are not inconsistent with Oswald’s appearance. The earliest discussion was probably a thread on the JFK Lancer forum, which at the time of writing no longer exists. http://educationforum.ipbhost.com/index.php?showtopic=20354 is the most complete discussion still online. http://reopenkennedycase.forumotion.net/t388–prayer–man–on–the–education–forum contains probably the highest proportion of constructive contributions. http://www.jfkassassinationforum.com/index.php?topic=8916.0 contains the lowest proportion of constructive contributions. Almost all valuable research is the product of collaboration. Dozens of people, most notably Sean Murphy, have made worthwhile contributions to the topic of Prayer Man. The following account is a summary of this research, with a handful of additional observations. Could ‘Prayer Man’ Have Been Oswald? Every witness who described the gunman’s clothing, including Brennan, claimed that it did not match Oswald’s clothing. Oswald was seen on a lower floor about 15 minutes before the shooting, at the same time as a spectator saw a gunman on the sixth floor. Oswald is known to have been on the first floor, in or near the domino room, about five or ten minutes after this. Reports in the Dallas Morning News and the New York Herald Tribune , both published on the morning after the assassination, state that Ochus Campbell, the vice–president of the TSBD company, and a policeman saw Oswald very shortly after the shooting in a “storage room on the first floor”; see http://educationforum.ipbhost.com/index.php?showtopic=20354&page=18#entry276903. The currently available evidence of Oswald’s location at the time of the assassination does not preclude him from being Prayer Man. A process of elimination allows the possibility that Prayer Man may have been Oswald. Five white men claimed to have been standing in the doorway during the assassination. All five may be ruled out, with varying degrees of certainty, as may all the other TSBD employees who might realistically have worn a dark casual shirt to work. Prayer Man’s location, at or close to the top of the steps with his back to the glass door, implies that he is likely to have been someone who worked inside the TSBD building, as were all the witnesses who claimed to have been standing in the doorway during the assassination. All of the TSBD’s white, male, manual workers were accounted for, apart from Oswald. Billy Lovelady, who can be seen standing close to the Prayer Man figure ( Warren Commission Hearings and Exhibits , vol.6, p.338). But no–one identified the figure in the doorway as anyone else either. Unsurprisingly, with everyone’s attention focussed on the presidential motorcade and the ensuing pandemonium in front of them, the figure standing behind them in the shadows went unnoticed. The lack of identification suggests that Prayer Man may have arrived late on the scene, almost certainly as an employee slipping out through the TSBD’s main doors, unseen by most or all of the other people on the steps. It is very unlikely that the Prayer Man figure was someone who did not work in the building. Other members of the public, as well as many TSBD employees, recognised that the best view was to be had from the side of the road rather than several yards back in a crowded doorway. The other thirteen people on the steps all worked in the building; most of them would surely have noticed an unfamiliar figure climbing the steps to stand among them, but none mentioned it, even when specifically asked about the presence of strangers in the TSBD that day. There was, in fact, one person whose presence on the steps, if noticed, might understandably have gone unmentioned. By the time the majority of their statements were taken, every witness would have been well aware that Lee Oswald had been shot dead while in police custody. Even before Oswald’s murder, the Dallas police had proclaimed him guilty, a conclusion later repeated consistently by the police, the FBI, politicians and, with very few exceptions, newspapers, television and radio. No–one may have gone on record identifying Oswald, but that in itself is not strong evidence that no–one saw him. In March 1964 the Warren Commission asked the FBI to interview every TSBD employee who was at the Elm Street premises on the day of the assassination. All of the 73 people interviewed were asked about their location at the time of the shooting. The relevant parts of their replies, all from CE 1381, are shown below, along with other pertinent statements. Some of the witnesses had made statements to the FBI within days of the assassination, which are collected in CD 5, although none of these statements contains information about the witnesses’ locations that does not appear in CE 1381. Every employee was asked in the March 1964 interviews if he or she had noticed a stranger in the building. All replied that they had not, which suggests strongly that Prayer Man was someone who worked in the building. Location: Thirteen TSBD employees stated that they were standing on the steps during the assassination. Breaking them down into categories that are relevant to the Prayer Man discussion: six were women, two were black men, and five were white men. Clothing: Ten other employees may have worn a shirt like Prayer Man’s. Three of the statements contain minor errors. Roy Truly, O.V. Campbell, Jeraldean (Mrs R.A.) Reid and Carolyn Arnold were claimed to have been on the steps, but their own statements make it clear that all four had moved away from the steps by the time the presidential motorcade arrived; for example, Roy Truly stated that he and Ochus Campbell were standing “out in Elm Street, 10 to 15 or 20 feet from the front steps. We first stood on the steps, the bottom steps a few minutes, and then we walked out in the line of spectators on the side of Elm Street” ( WCHE , vol.3, p.219). It is worth noting that many of the witnesses quoted below were standing on the TSBD’s steps for some time, and they too may have moved around. Their recollections in March 1964 of their exact positions at the time of the shooting will not necessarily be accurate. Billy Lovelady’s memory, for example, may have been influenced by his viewing of the Altgens photograph. He claimed to have been standing “to the far right against the wall,” as is wrongly implied by the angle from which the Altgens photograph was taken, but he can be seen in other images to be leaning against the hand–rail that runs down the middle of the steps. A photograph of the front steps and hand–rail from Elm Street. A photograph of the main entrance from inside the building. A photograph of the staircase and storage room door near the main entrance. A photograph of the first floor warehouse area. A plan of the first (i.e. ground) floor. A plan of the second floor. Was Prayer Man a Woman? If the Prayer Man figure was a woman who worked in the TSBD, the only plausible candidates are Pauline Sanders and Sarah Stanton, both of whom were standing on or near the top step, though probably at the opposite end from Prayer Man. The other four women on the steps claimed to have been on a lower step than Prayer Man, and their stories corroborate each other. All of the other female TSBD employees claimed to have been elsewhere. Was Prayer Man a Black Man? The Wiegman film shows one of the two black men, either Carl Jones or Roy Lewis, standing several steps below Prayer Man. He is by himself, as Roy Lewis claimed to have been. The precise location of the other man is not known. Other photographs may show Jones wearing a light–coloured shirt, like the man on the steps below Prayer Man, and Lewis wearing a dark shirt, like Prayer Man; see http://educationforum.ipbhost.com/index.php?showtopic=20354&page=145#entry310782, in which Lewis’s statement that he was “on the inside of the front entrance” is interpreted to mean that he was in the vestibule just behind the glass doors rather than on the steps. Was Prayer Man a Manual Worker? Of the manual workers who claimed to have been somewhere other than on the steps, all can be eliminated, with the possible but very unlikely exceptions of two whose locations are not corroborated by other witnesses: Troy West, the black man who claimed to have been on the first floor of the building, away from the main doors, and Jack Dougherty, the white man who claimed to have been on the fifth floor near the elevators. The fact that no–one reported seeing Dougherty is probably enough to rule him out. He was described by his boss, Roy Truly, as “a great big husky fellow” ( WCHE , vol.3, p.237); he would presumably have been noticed if he had wandered down to the first floor. Several frames of one of the films show a tall man with Buell Frazier’s distinctive profile, standing near Prayer Man (http://educationforum.ipbhost.com/index.php?showtopic=20354&page=42). Frazier was photographed in the police station that afternoon wearing a jacket consistent with the one worn by the man with his profile (photo: http://educationforum.ipbhost.com/index.php?showtopic=20354&page=2). Billy Lovelady can be ruled out with certainty if, as is generally agreed, he is the figure in the Altgens photograph. Frames from the Wiegman film show this person standing next to Prayer Man (photo: http://educationforum.ipbhost.com/index.php?showtopic=20354&page=6#entry276597). Joe Molina stated that he was standing just to the west of Otis Williams, who claimed to have been east of the “railing”, the hand–rail that runs down the middle of the steps, on the opposite side of the steps from Prayer Man. Molina would have been close to where Prayer Man was standing. Molina’s location does not appear to be corroborated by other witnesses. Molina was 39 years old at the time of the assassination, and described himself as being 5′ 7½″ tall, weighing 164 pounds, with a “stocky” build and “brown, graying” hair, “balding in front,” and a “fair” complexion (CD 1426, pp.17–18). This is not inconsistent with Prayer Man’s appearance, but it is perhaps more consistent with the sturdy torso of the figure wearing a suit, tie and white shirt who can be seen standing to the east of Billy Lovelady in the Altgens photograph (http://www.jfkassassinationforum.com/index.php/topic,8916.520.html). Joe Molina was the TSBD’s credit manager, and would presumably have worn a white shirt and a tie rather than a dark, casual shirt. William Shelley was almost certainly the man, thin and with angular cheek–bones and wearing a black suit and tie and a white shirt, who is seen in several photographs taken later on the day of the assassination. See http://educationforum.ipbhost.com/index.php?showtopic=20354&page=11#entry276716, which makes a good case that this man is Shelley, as well as the less good case that this man is the portly besuited figure near Lovelady in the Altgens photograph. It is more likely that the portly man is Molina, and that Shelley is one of the men shielding his eyes from the sun, as identified in the previous link. Either way, William Shelley cannot be Prayer Man. For a very plausible comparison of the thin, tie–wearing man with an earlier photograph of Shelley, see http://reopenkennedycase.forumotion.net/t388p585–prayer–man–on–the–education–forum. In his Warren Commission testimony, Shelley stated that after the shooting he and Billy Lovelady “ran out on the island [on Elm Street] … and we turned around and we saw an officer and [Roy] Truly” ( WCHE , vol.6, p.329). A frame from one of the films seems to corroborate this by showing two men heading away from the TSBD entrance; one of these men is wearing a shirt with a pattern like Lovelady’s (http://educationforum.ipbhost.com/index.php?showtopic=20354&page=54#entry278249). Marrion Baker is the only plausible candidate for the police officer whom Shelley saw. If Shelley had indeed moved off the steps by the time Baker arrived, he cannot have been Prayer Man; the Darnell film shows Prayer Man standing on the steps at the same time as Baker has almost reached them. Otis Williams stated to the FBI in March 1964 that “I was standing on the top step against the railing on the east side of the steps in front of the building.” Joe Molina corroborated this in his Warren Commission testimony: Otis Williams was “right next left of me.” Williams was a bookkeeping supervisor; like Molina, he was unlikely to have worn a casual dark shirt to work. Summary: Who Was Not Prayer Man? Buell Frazier is almost certainly the tall man standing near Prayer Man. William Shelley was probably standing on the other side of Lovelady, wearing a white shirt and tie, and was very likely to have left the steps by the time Prayer Man was filmed there. Joe Molina was probably standing close to Prayer Man’s location, but he was probably not wearing a dark, casual shirt. Otis Williams was probably standing further away from Prayer Man, on the eastern side of the steps, and was probably not dressed like Prayer Man. At the time of writing, the only members of this group whose appearance is known from contemporary photographs are Frazier and Lovelady, neither of whom was Prayer Man. The strong identification of Shelley in photographs taken on the day of the assassination, as mentioned above, suggests that he too was not Prayer Man. The identification of Molina in the Altgens photograph, as the portly besuited man near Lovelady, is weaker than that of Shelley, though perfectly plausible. The only photograph of Molina in public circulation dates from 1988: http://educationforum.ipbhost.com/index.php?showtopic=21772#entry311015. Williams’s appearance in 1963, and his possible resemblance to Prayer Man, remains a mystery. Oswald was certainly on the first floor a few minutes before the assassination. He was seen by Ochus Campbell very close to the steps soon after the shooting. Oswald’s build, facial features and hairline are consistent with those of Prayer Man. His clothing is consistent with that of Prayer Man. and an unknown member of the public, who went unnoticed despite having climbed the steps from the street. Otis Williams, who recalled that he was standing some distance from where Prayer Man is seen, and who was probably wearing different clothes. Pauline Sanders and Sarah Stanton, who were standing in the right general area but whose clothes and hair were probably unlike Prayer Man’s. Jack Dougherty, whose clothes were probably like those worn by Prayer Man but who was almost certainly on the fifth floor. Troy West, who was likely to have been wearing the same type of clothes as Prayer Man but was unlikely to have been standing on the steps, and whose skin almost certainly was darker than Prayer Man’s. The same combination of similar clothes but dissimilar skin tone applies to whichever of the two black men, Carl Jones or Roy Lewis, is not standing below Prayer Man. It was generally accepted for many years that Lee Oswald encountered Roy Truly and Marrion Baker in the TSBD’s second–floor canteen less than one and a half minutes after the shooting. The online discussions about Prayer Man revived a suggestion that this event may not have happened, and that any encounter between Oswald, Truly and Baker would instead have taken place close to the main entrance on the first floor. If Prayer Man was indeed Oswald, it is of course much more plausible that any encounter took place close to the main entrance, although it is not impossible that Oswald reached the second–floor canteen just ahead of Truly and Baker, if he had taken the set of stairs that were situated just inside the main entrance. For more about the pros and cons of the second–floor encounter, see the previous article about Lee Harvey Oswald’s alibi. It might be objected that the framing of Oswald would require him to be kept away from other people during the assassination. If he was seen watching the motorcade on the first floor, he could hardly be accused of firing a rifle from the sixth floor. There is, however, no reason to assume that Oswald needed to be falsely implicated in advance as the lone gunman on the sixth floor. Allowing Oswald to watch the motorcade from the main entrance with other TSBD employees would certainly risk ruling him out as the gunman on the sixth floor, but it would not rule out any involvement on his part in the assassination. Oswald apparently owned the rifle that was discovered on the sixth floor. This by itself was prima facie evidence of his involvement in the assassination, whether he fired the gun himself or merely supplied it to someone else. The Cuban and Soviet regimes were in turn linked to Oswald through his apparent support for the Cuban regime while in New Orleans in the summer of 1963, and his apparent encounters with a representative of the Soviet regime in Mexico City a few weeks before the assassination. At the time of writing, the only copies of the Wiegman and Darnell films in public circulation are of relatively poor quality. In the absence of unexpected new witness testimony, the only realistic way to resolve the identity of Prayer Man for certain would be to examine good–quality versions of these films, if any still exist. Although both Wiegman and Darnell were moving while taking their films, each film contains plenty of frames in which the images are reasonably sharp. What is lacking in the known versions is not sharpness but detail. It is possible that the original films or early copies will contain enough definition to allow Lee Harvey Oswald to be conclusively eliminated either as the figure in the doorway or as the gunman on the sixth floor. Where Are the Original Films? The original Wiegman film, or at least a good copy of it, may still exist. The original Darnell film probably no longer survives. WBAP had possession of the original Wiegman film, and if normal procedures were followed, the films would eventually be shipped out to NBC in New York. Soon after the assassination, NBC sold a copy of the Wiegman film (apparently the edited version) to Hearst Metrotone Newsreel …. According to one source, the HSCA located the original film at NBC News in Los Angeles. NBC made a gift of news film and television tapes of the President Kennedy era to the Kennedy Library in 1967. Copies of the original November 22 through 23, 1963, news coverage are available at the audiovisual department of the library. In 1988 … the Arts and Entertainment cable network rebroadcast videotape of the first 4½ hours of the NBC telecast including the original Wiegman assassination clip. As for the Darnell film, Trask reports that “Today most of the original 16mm prints of the work of Darnell, Couch … and the other cameramen are broken up at best, mislaid, unaccounted for, or completely lost at worst. None of their work was ever seriously collected or used in the FBI, Warren Commission, or HSCA investigations” (Trask, op.cit., p.430). All is not lost, however. It appears that a first–generation copy of the Darnell film exists at the Sixth Floor Museum in Dallas. The late Gary Mack, formerly the museum’s spokesman, wrote to a researcher early in 2015 that “a first–generation 16mm copy print … is in the Museum’s collection; however, the Museum cannot do anything with it until copyright issues are resolved. It’ll happen, and sooner rather than later” (see http://educationforum.ipbhost.com/index.php?showtopic=20354&page=110#entry298991). The figure in the shadows of the TSBD doorway may never be identified with certainty. Even if Prayer Man is identified and turns out not to be Lee Oswald, there is more than enough evidence placing Oswald somewhere other than the sixth floor during the shooting. Definitive proof that he was not the sixth–floor gunman would, of course, eliminate what little public support the lone–gunman hypothesis retains, and would provide further, very strong evidence that Oswald had been framed in advance of the assassination. The first television broadcast of the Zapruder film in 1975 generated widespread suspicion that the fatal shot had come from the front. The ensuing public outcry led to a lobbying campaign that forced the setting up of the House Select Committee on Assassinations. Although the HSCA’s investigation was hobbled, it nevertheless produced a good deal of useful information, all of it unfavourable to the lone–gunman hypothesis. Oliver Stone’s film, JFK , again brought the Zapruder film to the public’s attention and educated many casually interested members of the public about the flimsiness of the case against Oswald. 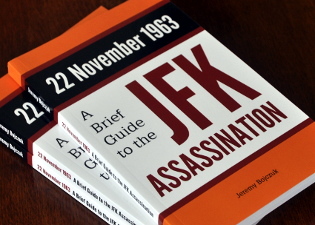 On this occasion, public opinion led to the setting up of the Assassination Records Review Board, which released a large number of previously classified documents that undermined the case for a lone gunman. Everyone understands that worthwhile social and political change comes about not through the benevolence of the powerful but through organised pressure from below. The same process has applied in the past to the JFK assassination, and can apply again. There is a large amount of potential public interest in the assassination, generally untapped, which becomes manifest whenever a major anniversary or a significant event occurs. The identification of Oswald as Prayer Man would surely ignite substantial public interest in the assassination. If it were properly organised, this support would make it very difficult for the authorities to resist giving the JFK assassination its first serious, honest investigation, which in turn would oblige the media to treat the assassination with more objectivity than it has managed up to now.